Heat sunflower oil on very low temp in small frying pan. Add distillate. Stir completely until oil and distillate are bonded. Create an emulsion of the vinegar and the oil, blending thoroughly. Add sugar if desired. Add salt and pepper to taste. 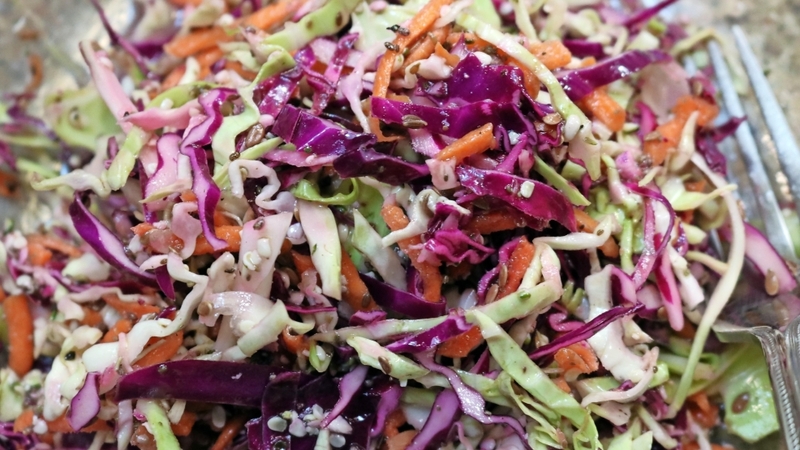 Marinate shredded vegetables, hemp hearts, poppy seeds, celery seed and dill seed in the mixture. Chill until quite cold (about 2 hours). Add additional oil or vinegar if desired. What to expect: The dose allows a comfortable buzz. I have a low tone tolerance, and I ate a one-cup serving. I had a comfortable high that lasted for hours. I always dose on the conservative side with edibles. It won’t get you loaded.